Installing vehicle wrap advertising on your vehicle turns your car into a traveling billboard – providing advertising for your business wherever it goes every minute of every day. Contact vehicle wraps Charlotte NC today!! With ten years experience serving the metro Charlotte area, Kanken Signs Vehicle Wraps is a leader in vehicle graphics and vehicle wrap installation. We are trained professionals with experience in 3M advertising wraps lettering, decals, and wraps for either a single vehicle or a full fleet. Vehicle wraps are a specialized product. A product that takes skill and experience to do correctly. We are experts in vehicle advertising wraps, and we pride ourselves on our high-quality work, with no surprises – just the best wraps and installation available on the market today. We have installed Charlotte vehicle wraps on over 1,000 vehicles, giving us an experience advantage over other wrap companies. We understand that proper installation is the key to a successful wrap, and we take the work seriously. We use only the highest quality 3M vinyl materials for our vehicle wraps. This attention to superior materials ensures that our wraps will be vibrant, attractive, durable, and last for 5 to 10 years. We price fairly and with sensitivity to the budgetary needs of our clients. We will never steer you toward something that you don’t need, and have tiered pricing based on the size of the vehicle to make it as affordable as possible. Our installers are some of the most knowledgeable and conscientious installers in Charlotte. If a mistake is made during installation, we have the ability to quickly print and install the new print to achieve the best quality vehicle wraps you will find in Charlotte, NC*. *While we strive the do our best, mistakes can happen. 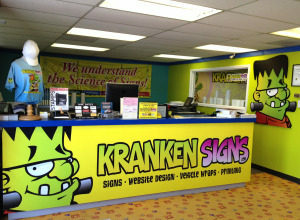 Please know that Krankensigns.com is not responsible for damage to customer supplied vehicle wrap material during the installation process. If you are supplying pre-printed graphics for installation, please also provide us with all original print files. In many cases Kranken Signs can reprint and install damaged graphics for a fraction of the replacement cost from your current graphics vendor. Ask your customer representative for more details.